In theory, this should be an easy project. 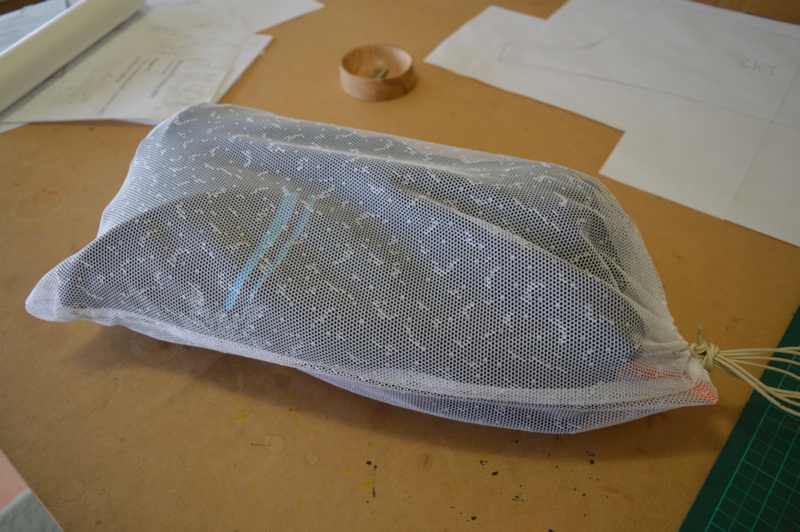 A couple of seams, seam-sealed, elastic tunnel on the edges… project done. 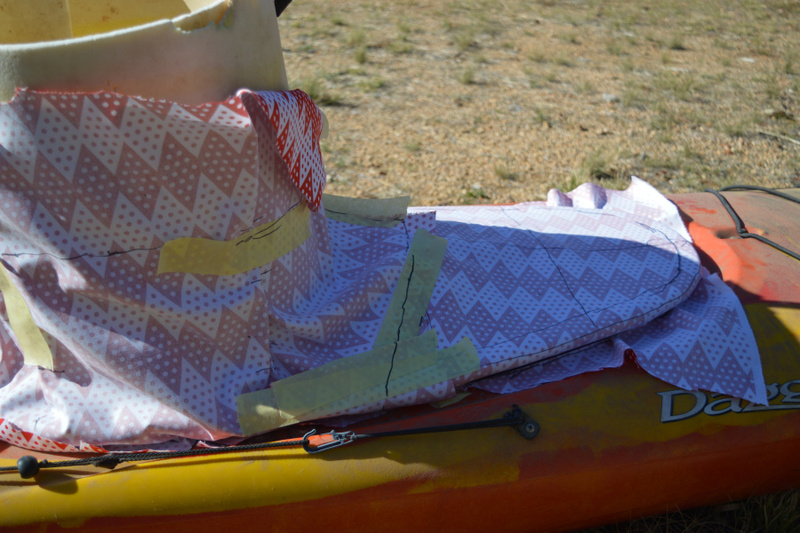 Too minor snags – no pattern and I don’t have access to the kayak I’m making it for. Plus as they weren’t for me, extra pressure to get it right. 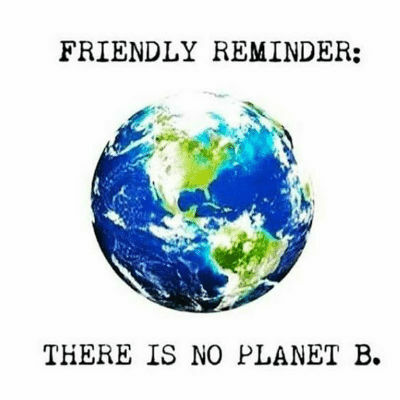 Ok, it’s not a real thing and I just made that up. But it does describe how I went about making the pattern. I’m making this for a friend, which I’ll affectionately call ‘Snowman’ for the purpose of this post. He’s had problems with his current spray skirt leaking and we’ve done a few repairs over time. 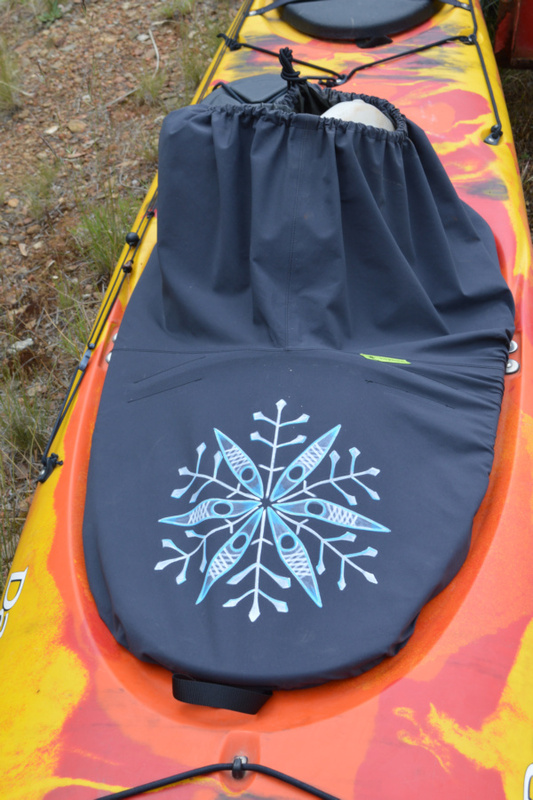 After making a new spray skirt for DH recently, DH come home with a template showing the comb shape of Snowman’s kayak and announced that he’d dobbed me in to make a spay skirt to fit it. Gulp! 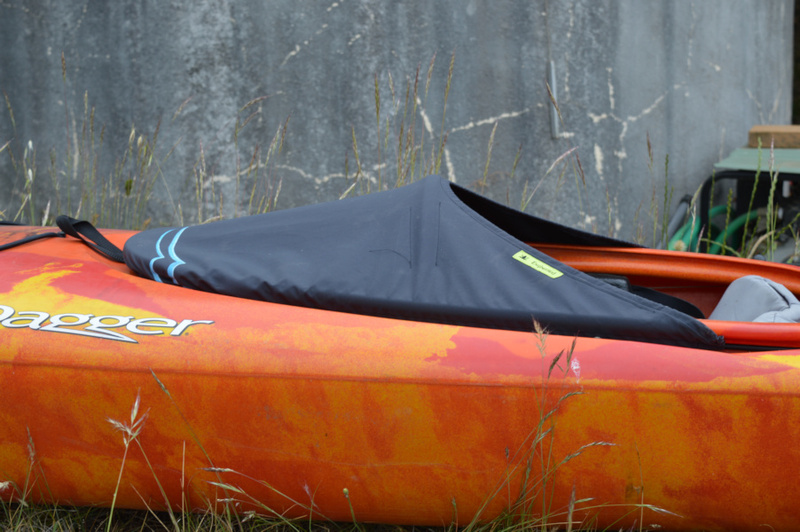 The comb of Snowman’s kayak is similar to that of my sea-kayak, although his is quite raised up and the front, and mine is very level. Unlike me, who uses the shortest peg position possible, he’s relocated his seat as far back as he can to allow room for his long legs. The comb also has what I’ll call ‘knobs’ that your knees hook under to help with rolling, which mine hasn’t got. 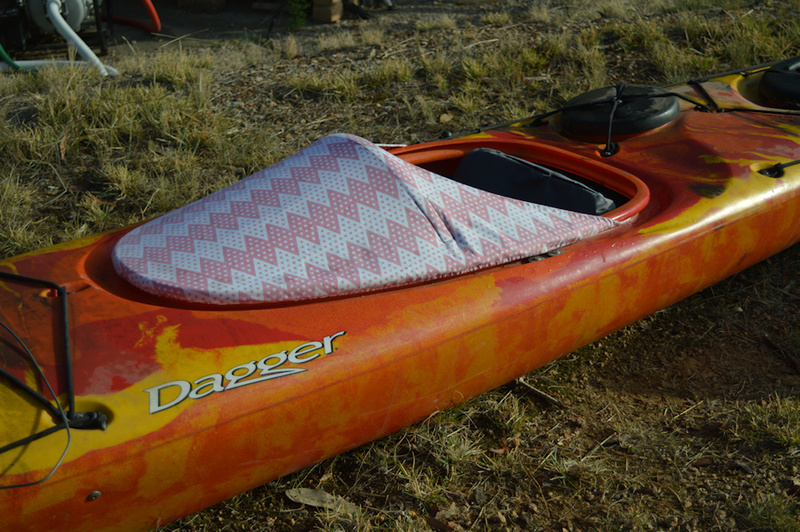 Despite this I decided to use my kayak to make a mock-up (and ultimately a half-deck for myself). I should say that the skirts will be used for lake/river touring. 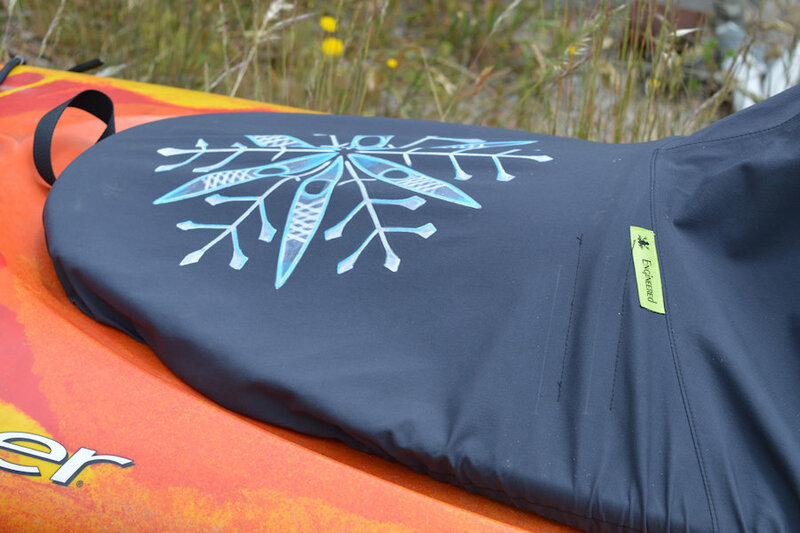 Enough to keep the water out during a paddle and don’t need to be able to withstand Eskimo rolling. The design of the full-deck is based loosely on the one that I did for the TK1 and the sun-deck was a design that has been kicking around in my head for a couple of years now. So armed with a bit of fencing wire, masking tape and some absolutely gorgeous fabric 😉 , I tried to drape the pattern. Oh, and roll of foam to act as a stunt double. The full-deck is just your standard touring style – seam at the centre front and also across the lap. I’ve held this up also with the flexible rod, but because a bit of bagginess is needed to lean fully back or forward, some water could still pool between the rod and the body. 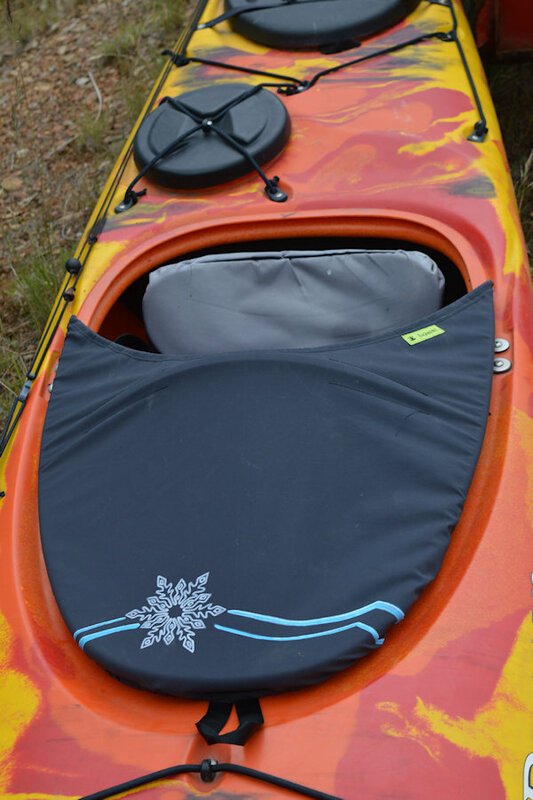 The idea for the sundeck has a flexible rod sits inside the comb near your lap and arches up to hold the top edge of the sundeck up. The rest of the deck is fairly taught and any water landing on it will fall away and off to the side of the comb. 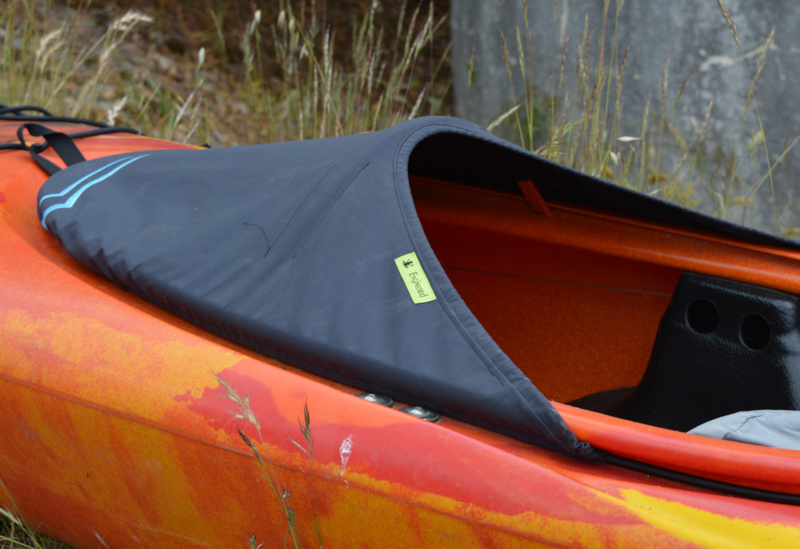 Thick 4-6mm bungee cord in the edge will provide a lip to prevent the water dribbling into your lap. With the patterns marked out, they were transferred onto paper and adjusted. 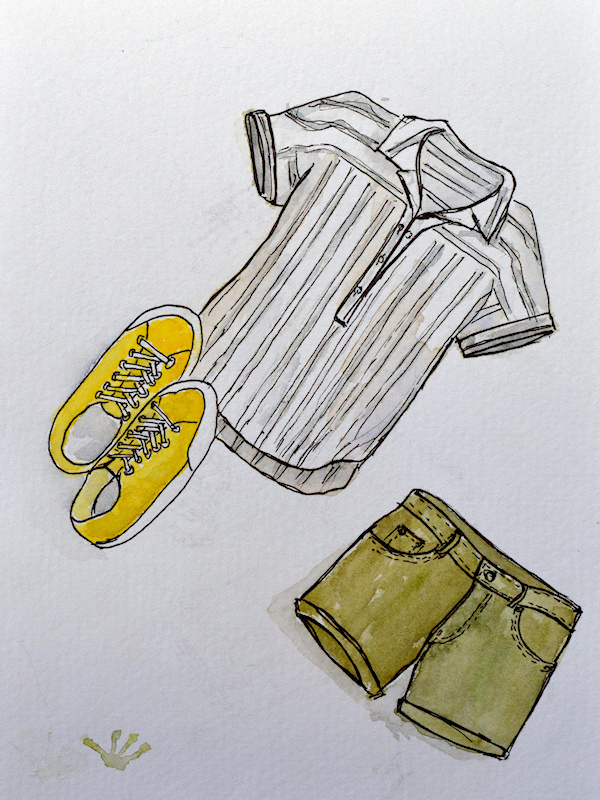 Then I did a mockup – that lovely fabric again. 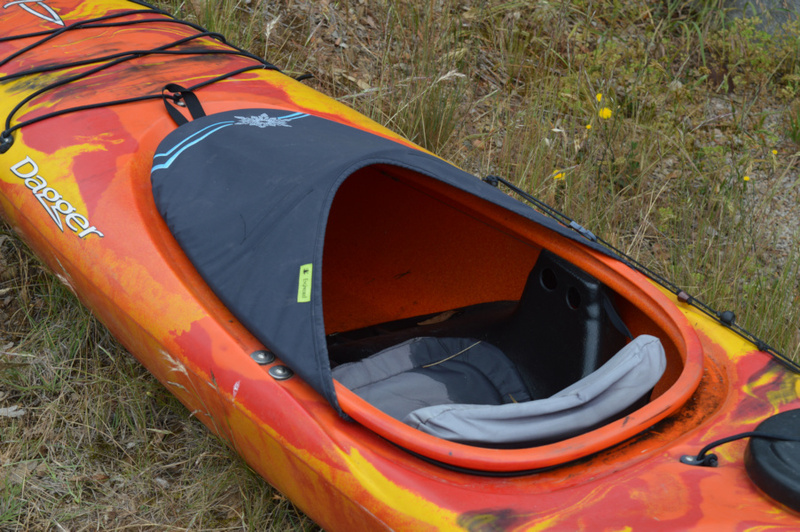 Checked it on my kayak and passed it on for a “fitting”. The mock-up came back with some pen marks to indicate changes. I needed to make some adjustments to move the rod position backward to clear the ‘knee knobs’ and also raise the waist level. We had a laugh about that as the new pattern comes up to my armpits – but it works for him. Here are the two decks. 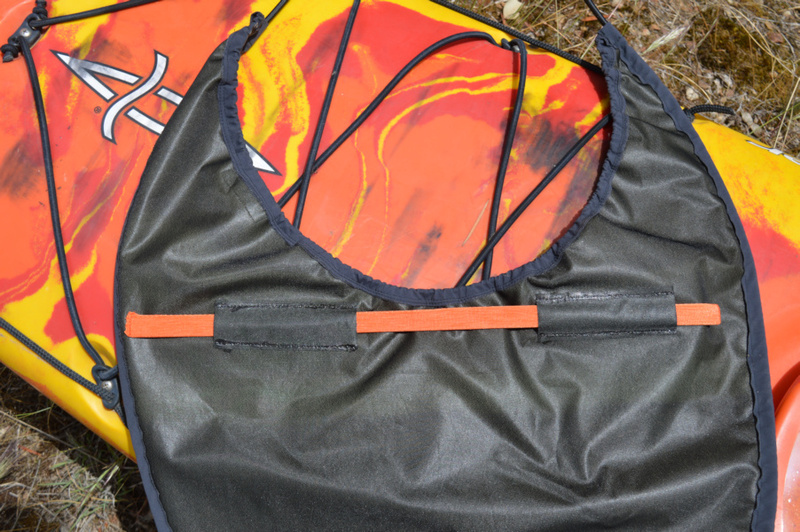 Sewn with goretex and seamsealed. Artworks (snowflakes by request) made using a paint marker. One of the ‘write on anything’ xylene-based kind as normal fabric paint wouldn’t stick to the fabric. Elastic is 4mm (waist) and 6mm (comb) bungee cord. Packaged and given to DH to pass on to Snowman. I don’t think he’s had a chance to use them yet, so it will be nice when I get a report back. I’m planning on making a half-deck for myself sometime soon. Can you get what artwork will be on mine? Don’t ask your other half if they have any seam sealing glue. They may have another “small” job for you to do now that the tube is opened. 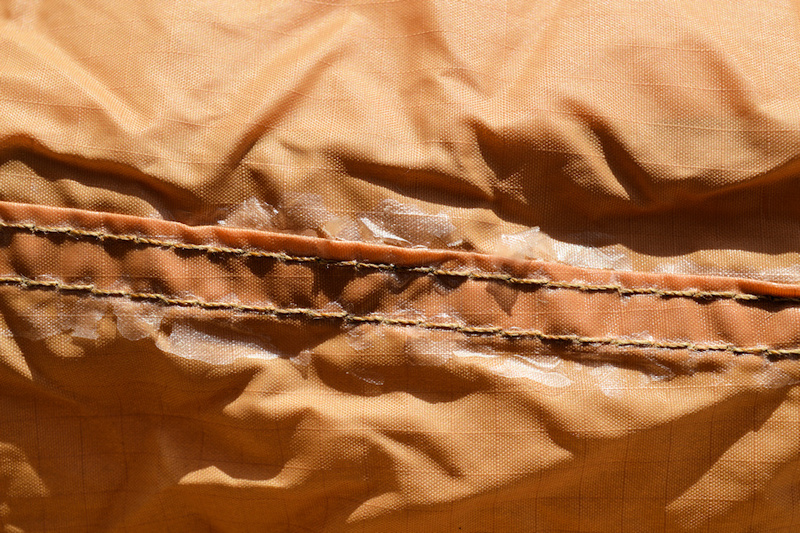 Exhibit A – What seam sealing looks like after 25 years –> flakey! 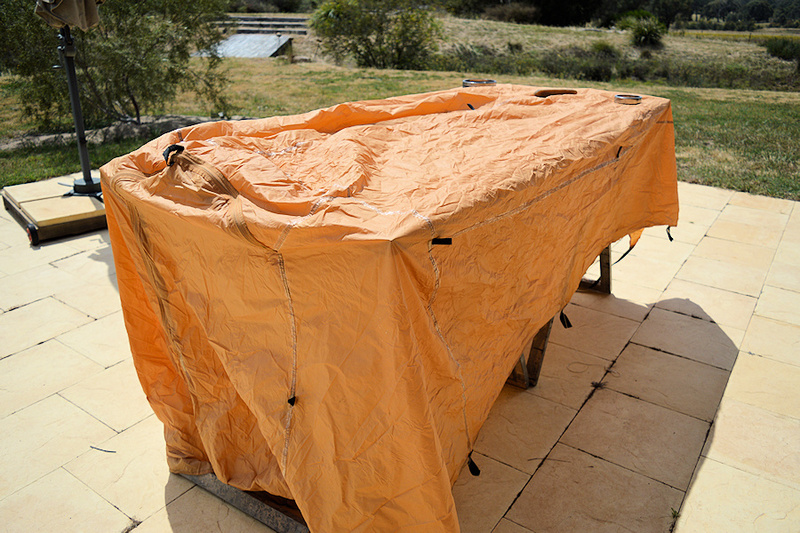 Exhibit B – The tent fly with 22m of double stitched flaking seams. Thanks Summerflies. 🙂 Yes, definitely a labour of love on both these projects. You are the most amazing person, both the sun deck and full deck are an amazing amount of work and Snowman must be thrilled with his custom set. Oh 22mm of seams to seal that is a labour of love.